Home > Animal Laws > Detroit Bans the 24/7 Chaining of Dogs! Detroit Bans the 24/7 Chaining of Dogs! Another win for the animals! 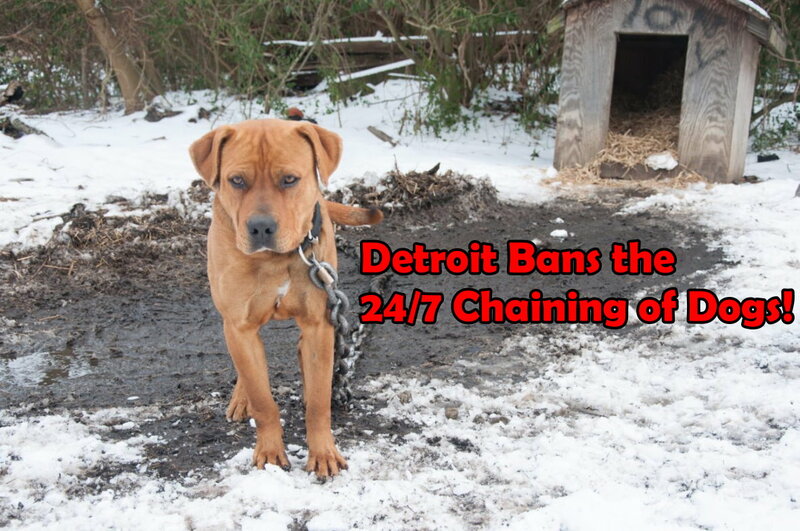 Detroit has banned the 24/7 chaining of dogs. That’s wonderful for all of the chained dogs of Detroit! Constantly being chained is really no life for a dog. Why bother having one, if you’re going to keep it chained up all of the time. If your dog can’t be in with your family, then you shouldn’t have a dog! Read more about it here, on Fox 2 Detroit. Continuously tethering a dog for more than three hours per day. Tethering a dog using a tether made of anything but a coated steel cable at any length less than three times the length of the dog measured from the tip of its nose to the base of its tail. Use a tether or any assembly or attachments that amount to more than 10% of the dog’s weight or that significantly inhibit the movement of the dog within the tethered area. Attach a dog to a tether by means of any implement other than a buckle-type collar or harness, so as to risk injury, strangulation, or entanglement of the dog on fences, trees, or other obstacles. Chaining of dogs without access to shade when sunlight is likely to cause overheating or without access to appropriate shelter for insulation and protection against cold and dampness when the atmospheric temperature falls below 40 degrees Fahrenheit. Tether a dog without securing its food and water source to prevent them from being tipped over or spilled by the tether. Chaining of dogs in an open area that does not provide the dog protection from attack from people or other animals. Chaining a dog in an area composed entirely of bare earth subject to becoming wet and muddy in the event of precipitation, and without any dry surface area for cover or protection. Tether a dog under four months old. Tether more than one dog to a single tether. Tether a dog to a stationary object that would allow the dog to come within five feet of any property line. Tether a dog without a swivel attached or equipped at both ends. The ordinance also provides for fines of up to $500, for those not in compliance with the new ordinance. And for third offense offenders, the possible loss of their pet. Hopefully, fewer dogs dying on the end of a chain due to weather, and neglect. It will also probably mean, at least for the short run, more people surrendering or abandoning their animals because they don’t want to get into compliance with the new law. All in all, it’s a great thing. Less neglected dogs around the city in the long run. Hopefully, this leads to more, better animal cruelty laws in not only Detroit but the rest of the world. Every area needs an anti-tethering law, to stop the 24/7 chaining of dogs!